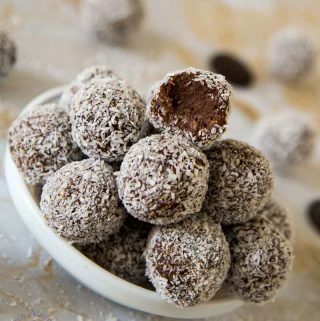 These coconut chocolate truffles are a treat any time of the year. 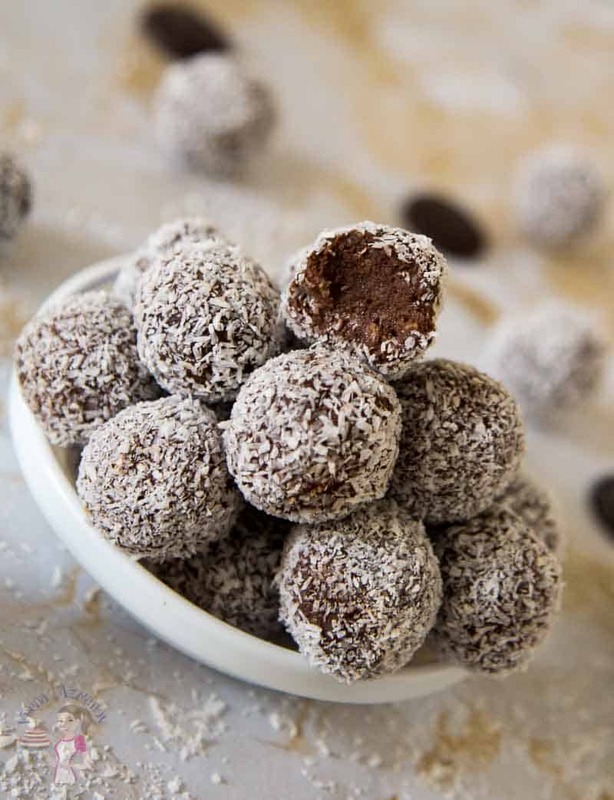 This simple, easy and effortless recipe made with coconut cream and rich dark chocolate then coated in crisp desiccated coconut that just melts in the mouth. These made perfect Valentine or mothers days treats but also perfect holiday gifts to give to family and friends. Chocolate Truffles remind me of mom. As a kid, this was one of our treats not just for eating but making it too. The recipe is so easy that kids can be apart of the recipe from start to finish. I remember mom used a double boiler and I’d really get so anxious sitting there watching the chocolate melt. Would be boring because it took a while but then she always let me stir letting all that chocolate so gloriously melt. Ain’t nothing like licking melted chocolate off your fingers. Waiting the night before you can roll them into balls would be the worst part of course. Often we’d make the truffle the next day after school – almost 24 hours later. Making those balls was fun not just because we had chocolate hands or that we could the mixture and coat them in whatever we wanted. Mom’s favorite was of course, was the classic cocoa powder but we’d get colored sugars, pearl sugar, chopped nuts, crystal sugar and my favorite sprinkles. But the best part of all this was that mom would let us invite friends to this truffle party! Boy, was that fun! Precious memories. 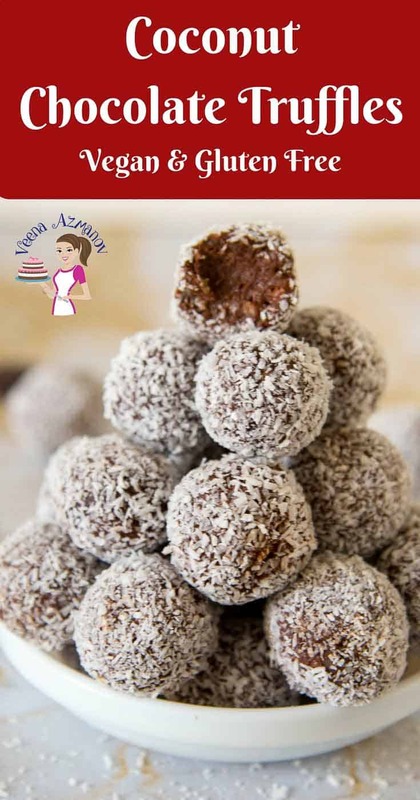 Coconut Cream – Coconut Chocolate truffles are usually made with fresh cream with coconut extract but I personally prefer to get a more intense coconut flavor by substituting the cream with coconut cream. Take note that the success of this recipe is in the thick coconut cream, not the regular coconut cream. I have highlighted how to make this thick coconut cream below as well. Chocolate – by now you know how I feel about chocolate. If you can’t eat it don’t use it! Nothing is worse than to bite into a dessert that’s made with low-quality chocolate, especially when chocolate is the main ingredient. So use a good chocolate that you love to eat. Desiccated coconut – I like to use desiccated coconut but you can use finely grated coconut too! The only difference is that finely grated fresh coconut has a shorter shelf life which means it needs to be refrigerated and it can’t be kept longer than 4 to 5 days. The Desiccated coconut can be kept for up to 2 weeks which make them ideal to box as edible gifts!! Place the can of coconut cream in the fridge for a couple hours until cold. When you open the can you will find the thick coconut cream and liquid separated. Gently scoop out the thick coconut cream into a separate bowl. The water can be used for other uses – soups, stews, and sauces. Use the thick coconut cream in this recipe below. You can also whip this coconut cream with sugar until light and fluffy just like whipped cream. 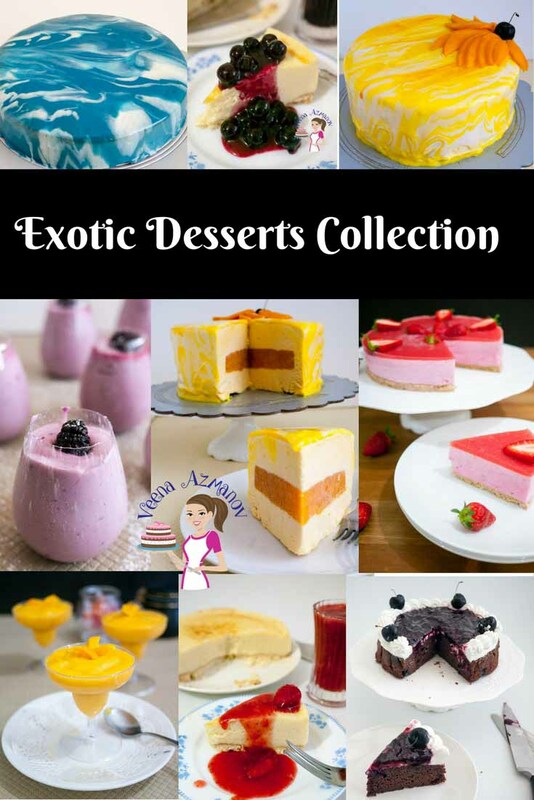 Edible Gift Ideas – for Valentine’s Day, Mother’s Day, Christmas! 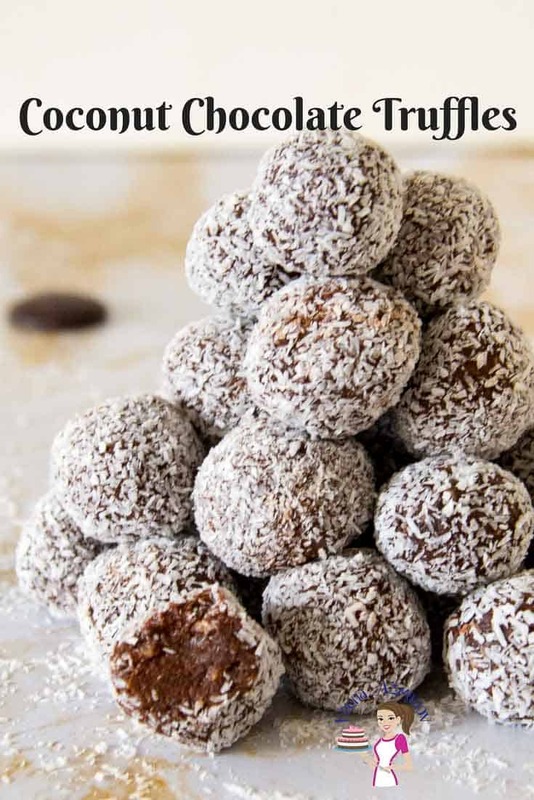 These chocolate coconut truffles would make amazing gifts for family, friends or a special loved one – don’t you think? It’s really simple, easy and affordable too! Not to mention a long shelf life so you can make it ahead of time? Ziv often gets me chocolates from Godiva, which is my favorite brand of chocolate and I do believe that truffles and chocolates make perfect gifts. Melt in the microwave for a minute or more until completely melted. 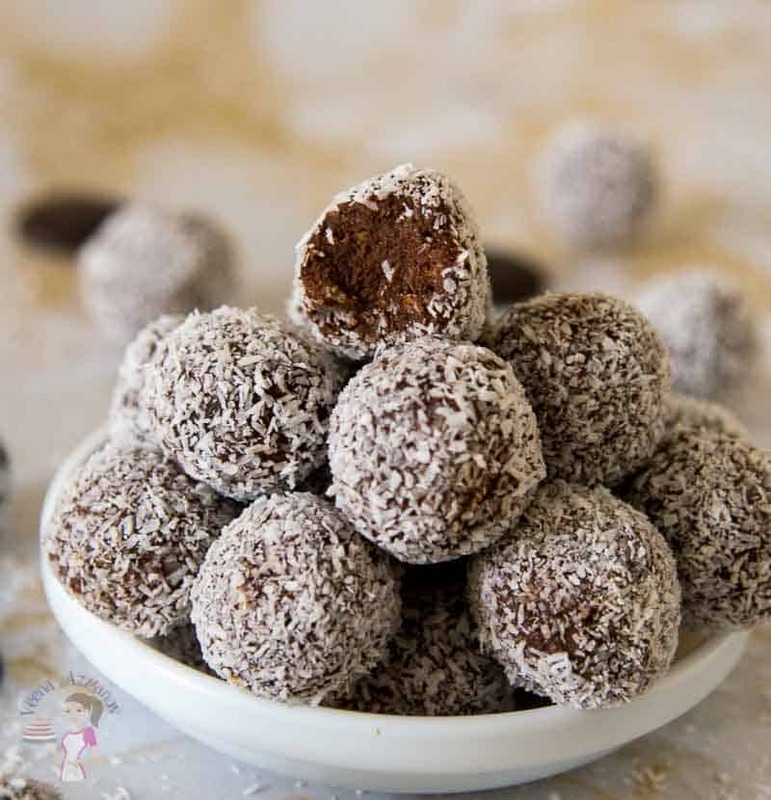 Place the desiccated coconut in a plate or bowl to dust the truffles. Gently but quickly roll the mixture into a ball. Then place it the desiccated coconut – roll is so it coats evenly. Place on a clean plate and continue with the rest of the truffles. Then place it the desiccated coconut - roll is so it coats evenly. This recipe looks amazing but what are you using to substitute the butter for it to be vegan? Or are you using a vegan butter? Thanks for the info. Thank you Smith. I hope you try it. Let me know how you like it. I love truffles such a great way to celebrate holidays or even Valentine’s day. The combination of chocolate and coconut it is also a great pairing. I want to try! Chocolate and coconut is definitely a good pairing. Thanks Adriana. The classic combo of coconut and chocolate NEVER goes out of style. I would devour a few of these at a time!! I just know they would be totally addictive….and delicious. Absolutely Gloria. 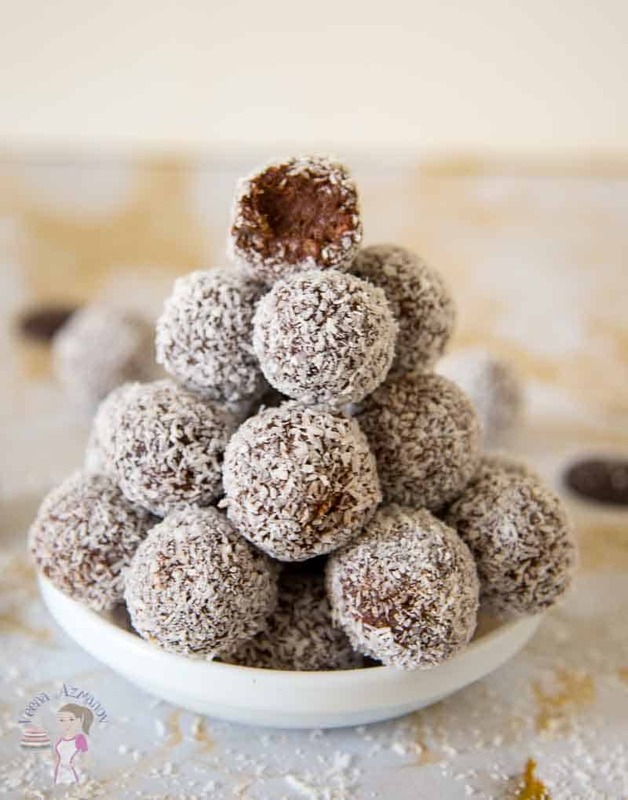 Chocolate and coconut always a great combination and definitely addictive. Thank you Teri. My favorite combination too! These look so good. Usually we only make chocolate truffles at Christmas, but I might have to make an exception. 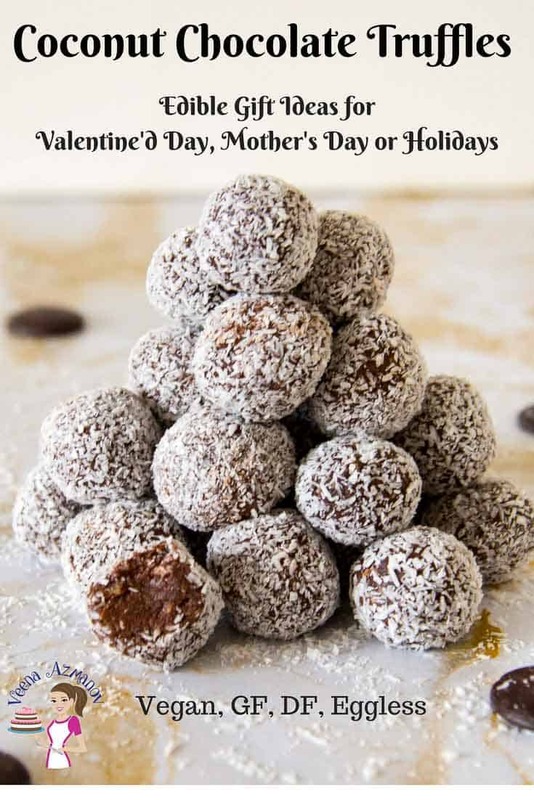 Chocolate truffles are not just Christmas – you must try it for Valentine’s Day! These are my kind of truffles! Such a delicious flavour combination! Thank you Marsha. Glad you think so. Love this combination too!